Purpose built modern serviced offices adjacent to Liverpool Street Station surrounded by shops, bars and restaurants. The unbranded fully furnished offices can accommodate between 1 and 100 desks, all of which come air conditioned, have the latest telephone systems and high speed broadband. Arranged over six floors, the offices and communal areas have been decorated and furnished in a very contemporary style which is bound to impress both you and your clients. There are three meeting rooms available to hire, showers, kitchen facilities and a customer lounge with comfortable seating, plasma television and complimentary drinks & newspapers. 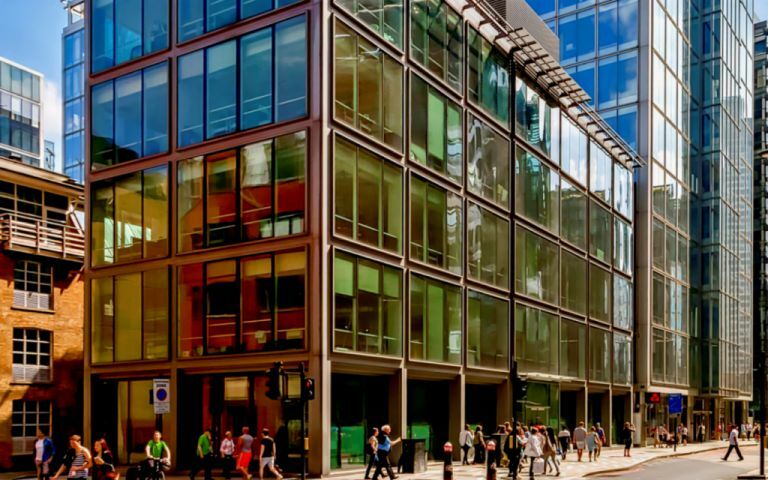 This London serviced office is adjacent to Liverpool Street Station with mainline rail services to Stansted Airport as well as the Central, Circle and Metropolitan underground lines. Our business centre features exceptional design and attention to detail. Boasting flexible workspace, event space, and more. Easy Offices Where is the nearest car park to Bishopsgate? Easy Offices Where is the nearest public gym to Bishopsgate? Easy Offices Where is the nearest coffee shop to Bishopsgate? Easy Offices Where is the nearest place to get lunch near Bishopsgate?